In this section, Meta Reviews Vintage Minolta Lenses for Sony Digital Cameras! Many Sony Digital Photographers don’t know that you can use many inexpensive Vintage Minolta A-Mount Lenses on all Sony A-Mount Cameras, including Sony’s latest Full Frame Sony a99 II Camera – Without using an adapter! 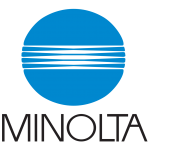 When Sony bought Konica-Minolta’s Camera Division back in 2006, they re-branded many of their Minolta Lenses as Sony Lenses, for use on Sony A-Mount Digital Cameras. 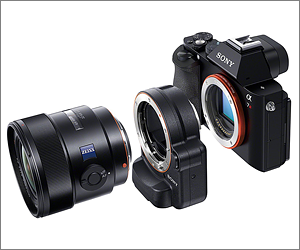 All Minolta “Maxxum”, “AF”, “Dyxum” and “Alpha” A-Mount Lenses will fit today’s Sony Digital Cameras, including A-Mount and E-Mount Sony Digital Cameras (Sony LA-EA4 A-Mount Adapter is required for all Sony E-Mount Cameras). These Vintage Minolta A-Mount Lenses were originally sold beginning in 1985 with Minolta Maxxium Film Cameras, such as the Minolta Maxxium 7000. Meta purchased her entire collection, of “Like New” and “Mint” 1985 Vintage Minolta A-Mount Lenses, for about the cost of one brand new Sony Lens! Meta uses all of these Vintage Minolta A-Mount Lenses on her Sony Digital Cameras, along with her Professional Grade Sony f/2.8 Camera Lenses. These Vintage Minolta Lenses have odd number Blade Apertures, which create beautiful sun burst effects. Most Vintage Minolta lenses use either ø49mm or ø55mm Filters. Meta’s two favorite Vintage Minolta A-Mount Lenses are the Super Sharp Minolta 50mm f/1.4 Prime Lens and the Wide Angle Minolta 24mm f/2.8 Prime Lens. Meta’s 1985 Vintage Minolta Lenses: 35–70mm, 24–50mm, 35–105mm, 100–200mm, 28–135mm, 70–210mm, 75–300mm and 50mm mounted on her Sony A77 II Camera. Meta’s Collection of 1985 Vintage Minolta Lenses were purchased online on average for $35 to $70 each! Many were still attached to some very old Minolta Maxxium Film Cameras (many were tossed)! These 1985 Vintage Minolta Lenses were constructed using heavy metal bodies, were longer but had higher build quality of any of the Vintage Minolta Lenses. These Heavy Metal Lenses can be identified by the tight ribbed silicon focusing ring, which sometimes oxidizes over time. 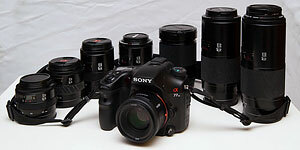 Auto Focus is performed using a motor driven shaft, which is still present in today’s Sony A-Mount Digital Cameras. The Vintage Minolta Zoom Lenses listed below are listed by “Constant Aperture” and “Variable Aperture” models. Constant Aperture Zoom Lenses are considered better than Variable Aperture Zoom Lenses, because they maintain a fixed aperture as the lens is zoomed in and out, thus maintaining a constant exposure level. Variable Aperture Zoom Lenses get slightly darker when they are zoomed in. In the early 1990’s, Minolta started producing less expensive lenses, made with plastic bodies, which were shorter and much lighter. These lenses had a wide and smooth silicon focusing ring with large oval indents. The build quality of these 1990’s Plastic Body Lenses wasn’t nearly as great as the Original 1985 Heavy Metal Lenses. For this reason, Meta recommends only buying the 1985 Vintage Metal Models listed below. Silicon Ring Oxidation, caused by years of UV Sun Damage, can occur on Vintage Minolta Silicon Zoom and Focus Rings. Clean the exterior of your Silicon Rings with Alcohol Wipes, then use Wooden Q-Tips to scrub the Silicon Rings. Rub a tiny drop of Silicon UV Protection on the Silicon Focus and Zoom Rings to further protect them from UV Sun Damage. NOTE: Not all Vintage Minolta Lenses are A-Mount Lenses and won’t fit Sony A-Mount Cameras! Only the “Maxxum”, “AF”, “Dyxum” and “Alpha” Lenses will fit. 1984 and older “Rokkor”, “MF”, “MC” and “MD” Minolta Lenses WILL NOT FIT on Sony A-Mount Cameras. You Can Use Vintage Minolta Lenses on Sony E-Mount Cameras Too! The Sony LA-EA4 A-Mount Adapter. (Photo: Left) allows the connection of all Minolta A-Mount Lenses on Sony E-Mount Cameras. This Sony Lens Adapter contains the necessary Focus Drive Motor System and Translucent Mirror, required to Auto Focus the Vintage Minolta Lenses. This Sony A-Mount Adapter opens up a huge E-Mount Sony Digital Camera market for these inexpensive Vintage Minolta Lenses! NOTE: The Minolta “Zoom xi Motorized AF Lenses” will not Auto focus on the E-Mount Cameras due to their different focusing method. These lenses are NOT recommended. One issue with many Vintage Minolta Lenses is Lens Flair, due to the shorter Stock Lens Hoods. A Simple Minolta Lens Flair Fix is to use the longer clip on Stock Lens Hoods from the ø49mm 100–200mm f/4.5 Lens and the ø55mm 100–300mm f/4.5–5.6 Lens! These Longer Minolta Lens Hoods are easily found online for about $10 each. This Constant Aperture f/4.0 zoom lens offers great versatility in a compact, lightweight lens. This zoom lens has become a popular kit lens since it covers the wide angle to telephoto range used most often. Its responsive, adapting to most hand held situations in an instant. Useful Macro Switch at 70mm. This popular kit lens was often sold with the 70–210mm f/4.0 Zoom Lens, to cover the full 35–210mm range. This is one of Meta’s Favorite Light Weight Walk Around Lens. APS-C Crop Factor: 35–70mm x 1.5 = 52–105mm. Weight: 256gm. ø49mm Filters. Lens Flair Fix – Use the longer lens hood from the ø49mm 100–200mm f/4.5 Lens! Minimum Focus Distance: 1.0m – 32cm. Optics: 6 elements, 6 groups. Fits in Lowpro 9 x 9cm Lens Case. The Famous “Beer Can Lens”! Many situations require a Constant Aperture f/4.0 telephoto zoom lens that can isolate specific details from a distance. Useful Macro Mode at 210mm. This lens was often sold together with the 35–70mm f/4.0 Zoom Lens above. APS-C Crop Factor: 70–210mm x 1.5 = 105–315mm. Weight: 695gm. ø55mm Filters. Heavy for Walk Around Use. Amazing Sharp Lens. Good for Macros. Works at f/11. Meta has two of these great zoom lenses. Lens Flair Fix – Use the longer lens hood from the ø55mm 100–300mm f/4.5–5.6 Lens! Optics: 12 elements, 9 groups. 1985 Dollars Sales Price: $192 – Buy This Lens! Fits in Lowpro 9 x 16cm Lens Case. For photographers who regularly work at longer distances, the Constant Aperture of f/4.5, 100–200mm range is an excellent choice. No Macro Mode or Macro Switch. APS-C Crop Factor: 100–200mm x 1.5 = 150–300mm. Weight: 375gm. ø49mm Filters. Sharp Telephoto Lens. Cheaper and lighter alternative to the heavy 70–210mm f/4.0. Optics: 8 elements, 7 groups. Fits in Lowpro 9 x 13cm Lens Case. This Wide Angle Zoom Lens has a Constant Aperture of f/4.0 for Landscape Photography. APS-C Crop Factor: 24–50mm x 1.5 = 36–75mm. Weight: 285gm. ø55mm Filters. No Macro Mode or Macro Switch. Optics: 7 elements, 7 groups. 1985 Dollars Sales Price: $496 – Very Expensive! This big and heavy, but tremendously versatile zoom lens lets you move from wide, sweeping effects to much closer details. Limited Macro Switch at 28mm. Many photographers refer to this lens as the “Secret Handshake Lens”, while based on the urban legend that it was a co-designed by both Minolta and Leica. Some say it’s almost “G” Quality and is one of the best lenses Minolta ever made. Unlike the other Vintage Minolta Lenses, this one has a larger ø72mm front element, with the focusing ring in the rear. APS-C Crop Factor: 28–135mm x 1.5 = 42–203mm. Weight: 750gm. ø72mm Filters. Aperture Change Point: f/4.0 28–40mm, f/4.5 40–135mm. Minimum Focus Distance: 1.5m – 25cm in Macro Mode. Optics: 16 elements, 13 groups. Heavy for Walk Around Use. Amazing Lens. Comes with no stock lens hood. Screw On 72mm Rubber Lens Hood works best for Lens Flair! The Famous “Big Beer Can Lens” extends almost a foot long with the Lens Hood attached. Versatile 75–300mm zoom lens, f/4.5– 5.6, is ideal for a variety of purposes, from sports action to portraiture, as well as hummingbirds, wildlife and macro photography. APS-C Crop Factor: 75–300mm x 1.5 = 113–450mm. Weight: 865gm. ø55mm Filters. Aperture Change Point: f/4.5 75–100mm, f/5.0 100–135mm, f/5.6 135–300mm. Useful Macro Mode at 300mm. Long and Very Heavy for Walk Around Use. Very Sharp. Meta has two of these great zoom lenses. Optics: 13 elements, 11 groups. 1985 Dollars Sales Price: $744 – Very Expensive – Buy This Lens If You Can Find One in Good Condition! This handy mid-range zoom gives you great flexibility in handling a variety of subjects. APS-C Crop Factor: 28–85mm x 1.5 = 42–128mm. Weight: 490gm. ø55mm Filters. Aperture Change Point: f/3.5 28–35mm, f/4.0 35–60mm, f/4.5 60–85mm. Minimum Focus Distance: 80cm – 25cm. Optics: 13 elements, 10 groups. Limited Macro Switch at 28mm at 9 cm. Very Good All Around Lens for the money! 1985 Dollars Sales Price: $596 – Very Expensive! APS-C Crop Factor: 35–105mm x 1.5 = 52–158mm. Weight: 495gm. ø55mm Filters. Aperture Change Point: f/3.5 35–36mm, f/4.0 36–70mm, f/4.5 70–105mm. Useful Macro Switch at 105mm. Amazing Lens. Minimum Focus Distance: 1.4m – 410cm. Optics: 14 elements, 12 groups. APS-C Crop Factor: 50mm x 1.5 = 75mm. Light Weight: 235gm. ø49mm Filters. Tiny Built-in Useless Lens Hood. One of the few fast Prime Lenses that can shoot very well at 1/8,000th of a second. This is Meta’s favorite f/1.4 Super Sharp Prime Lens for shooting Hummingbirds, Sunrises, Sunsets and Fireworks. This lens is similar to the much cheaper 1985 Minolta Maxxum 50mm f/1.7 Prime Kit Lens, but much harder to find. Meta has two of these super sharp prime lenses. Optics: 7 elements, 6 groups. 1985 Dollars Sales Price: $266 (Sold as a Kit Lens Upgrade) – Buy This Amazing Lens! Superseded by the $1500 Sony SAL-50F14Z, but you can still find this super sharp lens for around $150. Screw On 49mm Rubber Lens Hood works best for Lens Flair. APS-C Crop Factor: 24mm x 1.5 = 36mm. Light Weight: 215gm. ø55mm Filters. Comes with a small Tulip Lens Hood and Small Leather Carrying Case. This is Meta’s favorite f/2.8 Wide Angle Prime Lens, which is great for shooting tight Interior shots and wide Landscape Photography. Meta has two of these wide angle great prime lenses. Optics: 8 elements, 8 groups. 1985 Dollars Sales Price: $436 – Very Expensive – Buy This Lens! Screw On 55mm Rubber Lens Hood works best for Lens Flair.